Denver is an old city and with that comes old homes. The great thing about an old house is that it has character and tells the story of all those that have lived there before you. Unfortunately many homes built before the 1950’s simply don’t have the ductwork necessary for the convenience of modern day air conditioning systems. This is where ductless air conditioning comes in. A ductless system allows you all the benefits of AC without having to install expensive ductwork. Why chose ductless air conditioning? Although most people know us for our beautiful mountains and snow, the summers here in Denver can be pretty brutal sometimes. This makes air conditioning a necessity, not just a frivolous luxury. If you are looking for central air without having to install expensive ductwork than a ductless or mini split AC may be right for you. 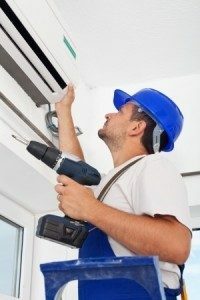 A traditional air conditioning system can cost as much as $6000. Not to mention the sheer mess caused from having to install all new ductwork throughout the house. Some older houses simply don’t have the room to install ductwork. When they were built air conditioning was just an idea, so the builders did not construct with this in mind. When you walk into the room do you want to feel that rush of icy air across your face? Well with a mini split system you get to decide where you want your air to come from. Do you really use all of your home at once? Think of all the wasted energy i.e. money that gets used cooling the parts of the house that you hardly ever use. With our Fujitsu ductless AC system you can now cool the areas you use most. Here at Sanders & Johnson, Inc. Heating and Air Conditioning we can install your ductless air conditioning. Give us a a call today at 303-422-6606 to have one of our skilled professionals come out and give you a free installation estimate on your new ductless air conditioning system in Denver, CO. Just fill out our form and contact us today!